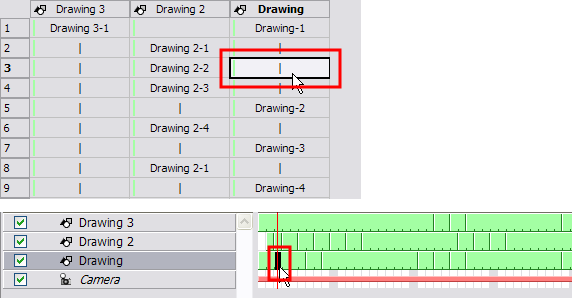 Once a cell is selected in the Timeline or Exposure Sheet view, you can navigate between the layers and drawings using keyboard shortcuts that work in the Camera, Drawing, Timeline and Exposure Sheet views. 1. 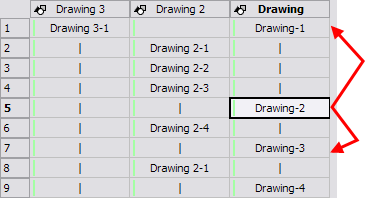 In the Timeline or Exposure Sheet view, select a cell. ‣ Previous and Next Timeline Layers: Press [D] and [F]. 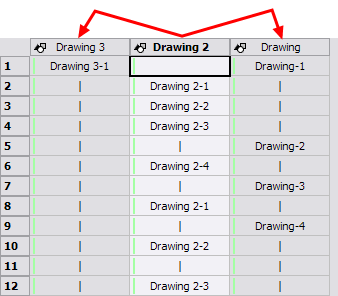 ‣ Previous and Next Exposure Sheet Column: Press [Shift] + [D] and [Shift] + [F]. ‣ Previous and Next Drawings: Press [Shift] + [A] and [Shift] + [S]. ‣ Previous and Next Frames: Press [A] and [S].